The Commando Veterans Association was formed to ensure that the unique spirit, tradition and camaraderie of the Commandos do not fade but are kept alive, for present and future generations. The title "Commando Veterans Association" does not refer to war veterans, but to all Commandos, serving and retired, veterans of the Green beret. Like all Forces personnel, former and serving Commandos rely on their family and friends for support. This is especially true for those returning having seen active service. Therefore the Commando Veterans Association encourages family and friends of Commandos to apply for Associate membership and continue this support through the work of the Association. 1. Title The title of the Association shall be ‘The Commando Veterans Association’, short name ‘The CVA’. 2. Address CVA HQ , 56 Mason Road, Headless Cross, Redditch, Worcestershire, B97 5DU, England. 3.1 The CVA shall mean the Commando Veterans Association. 3.2 The President shall mean the President of the CVA. 3.3 The Vice President shall mean the Vice President of the CVA. 3.4 The Chairman shall mean the Chairman of the CVA. 3.5 The Officers shall mean the Officers of the CVA. 3.6 The Standing Committee shall mean the Standing Committee of the CVA. 3.7 The Annual General Meeting (AGM) shall mean the AGM of the CVA. 4.1 Maintain comradeship and esprit de corps between members of the CVA and to promote fellowship between Veterans, their families and friends of the Commandos. 4.2 To carry forward the history of the Army Commandos, alongside that of the Royal Marines Commandos who have the Royal Marines Association (RMA). 4.3 Assist in forming new Branches and to promote and maintain contact between existing Branches. 4.4 Arrange a Reunion, an AGM and other meetings as required. 4.5 Promote opportunities for members to contribute to the development of the CVA. 4.6 Contact those members in need and provide assistance wherever possible. 5.1 Full membership of the CVA shall be open to all ranks/ratings that have earned the coveted Green Beret and have served or are serving in the Commandos. Associate membership shall be open to families and friends of Commandos if sponsored by one FULL member. Honorary Full membership can be bestowed upon an Associate member if proposed by two Full members, the final decision being that of the Committee. Honorary Full and Associate members are entitled to be present at meetings but have no voting rights. 5.2 In the event of a discreditable act by any Member, the Committee will enquire into the complaint and if justified, the offending Member may be expelled from the CVA. The CVA subscription period shall be from 1st April until 31st March in each year. There is a £5, one off, joining fee in addition to an annual subscription of £12 UK and £15 overseas. The joining fee and first year's subscription should be included with the application form. Any member joining after 31st March shall be deemed to have paid their subscriptions for the following year. Subscription fees can be reviewed annually by the Committee at the AGM. 7.1 The supreme governing body of the CVA shall be the AGM. 7.2 There shall be a Standing Committee which shall conduct the financial and general affairs of the CVA subject to any direction from the AGM. 7.4 Elected members will normally serve for a minimum period of one year. 7.5 The Standing Committee shall meet at least once a year. 7.6 The powers of the Standing Committee shall be to determine the policy whereby the aims and objectives of the CVA may be achieved, subject to direction by an AGM. 7.7 Any member of the CVA may be co-opted to service on sub-committees to deal with particular items of business. 7.8 The CVA must follow the aims and objectives laid down and it must democratically represent the membership group for which it is established. 8. Officers The Officers of the CVA are the President, the Vice President, the Chairman, the Secretary, the Treasurer and up to 3 Committee Members. 8.1 The President shall be elected from among the members of the CVA and should hold office for one year. They are to be active and advise the Committee when needed. At the expiration of office the President is eligible for immediate re-election. 8.2 The Vice President shall be elected from among the members of the CVA and should hold office for one year. They are to be active and advise the Committee when needed. They shall deputise for the President in the event of the President’s absence. At the expiration of office the Vice President is eligible for immediate re-election. 8.3 The Chairman shall be elected from among the members of the CVA and should hold office for one year. They are to be active and to be the driving force behind the Committee. The Chairman shall normally preside at meetings of the CVA and at meetings of the Standing Committee. At the expiration of office the Chairman is eligible for immediate re-election. 8.4 The Secretary and Treasurer shall be elected from among the members of the CVA and should hold office for one year. The Secretary and Treasurer can be the same elected member. issue notices, attend meetings of the CVA and its Standing Committee, be responsible for issuing the necessary minutes of such meetings and ensure that resolutions are communicated to the proper persons, or otherwise duly carried out. 8.6 The Treasurer shall be responsible for the financial arrangements of the CVA and for preparing an annual statement of accounts for audit at the AGM. 8.7 They shall deputise for the Chairman in the event of the Chairman’s absence. At the expiration of office they are eligible for immediate re-election. 8.8 Members will be volunteers who are willing to assist the Standing Committee in organising events, or who are able to assist in specific areas such as Welfare. 9.1 The supreme governing body of the CVA shall be the AGM subject to statutory duties placed on Officers and the Standing Committee. 9.2 An AGM shall be summoned at least once in every year and at such other times, as the CVA shall determine. 9.3 An extra-ordinary meeting may be called by the Chairman and can also be called on written request to the Secretary of at least TEN members of the CVA. 9.4 The quorum for the AGM or any meeting shall be FIFTEEN members. In the event of the quorum not being achieved, the meeting may discuss the agenda and advise the Standing Committee. Power to determine any matter on the agenda shall be the responsibility of the Standing Committee. 10.1 The Standing Committee shall be responsible for ensuring that proper books and records of all CVA income and expenditure are maintained. 10.2 No member of the Standing Committee shall have power to borrow money. 10.3 Expenditure shall not be incurred by the CVA in excess of the income. 10.4 The accounts of the CVA shall be audited at the AGM. A statement of audit is to be signed by the elected auditor and countersigned as verification by an additional member. 11.1 The Annual Commando Gathering at Fort William (including annual draw), the Service at Westminster Abbey, the St George’s Day celebrations at the Royal Hospital Chelsea, the Commando Summer Service at the National Memorial Arboretum and an Annual Dinner night will be co-ordinated by the Standing Committee. 11.2 CVA events will be advertised in the CVA Dispatches newsletter and the CVA website. 13. Newsletters A newsletter – Dispatches – will be issued every four months (Feb, Jun, Oct). Members are kindly requested to submit articles and photos for each edition. 14.1 The Data Protection Act prevents the CVA from providing lists of members to any outside agencies. Members’ details will only be given to other existing CVA members where permission has been granted by that member to the CVA Secretary. 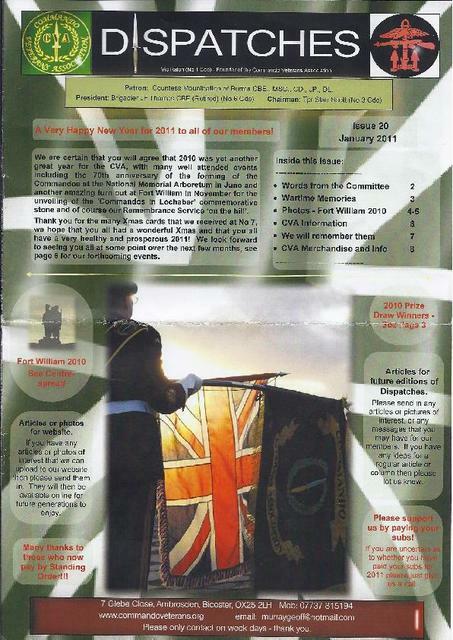 14.2 CVA details, updates and a calendar of events will be published in the CVA Newsletter and on the CVA website. CVA HQ , 56 Mason Road, Headless Cross, Redditch, Worcestershire, B97 5DU, England. Formed as a result of the decision made by the Committee of the original Commando Association to stand down in 2005. This document was written by John Mewett, son of Private Robert Mewett [more...]. N.B. If the document viewer below does not display immediately refresh/reload the page, or download from above. Formed in 1943. Formal stand down in 2005. This document, written by Henry Brown, the Association's General Secretary and Treasurer, covers the period 1943 to 1993. From the collection of Lance Sergeant Joseph Rogers MM [more ...]. A beautifully produced Commemorative Souvenir booklet to celebrate the Commando Association, from its formation in 1943 to Standown in 2005. The booklet contains superb photos along with a great deal of information about the history of the Commandos. It is a valuable addition to the information we already have in our Gallery about the original Association. Click on the word 'Download' above to view this document, and then why not browse our Gallery entries here Commando Association . Page 15 of this booklet for "Lieut. G.K. Knowland of No 1 Commando." substitute "Lieut. G.A. Knowland of No 1 Commando." This form is for all Commandos who served in WW2. This form is for applications for associate membership. Associate membership is open to family and friends of Commandos, and all who have an interest in the Commandos. Your membership application should be sponsored by a current member. If you have any enquiry about content for the newsletter, or would like to contribute an article, contact the editor. There are 3 editions each year and we rely on the content submitted by you for them.